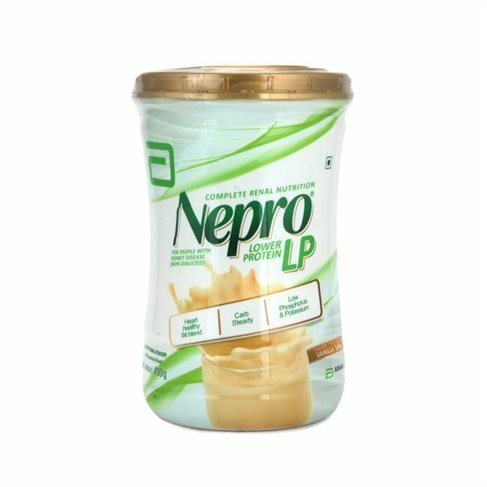 Abbott Nepro Lower Protein (LP) Powder is a nutritional supplement useful in the patients suffering from renal impairment. Presented in vanilla flavour, it consists of vitamins and minerals. and is a high energy, complete, moderate protein, and fibre enriched feed, fulfilling the nutritional intake of dialysis patients. The powder provides balanced nutrition, helps in gaining and maintaining a healthy weight, replaces protein lost during dialysis and supports tissue maintenance and repair. It also helps in the maintenance of normal bowel function,. This lactose and gluten free powder is a ready to use easily digestible nutritional drink.